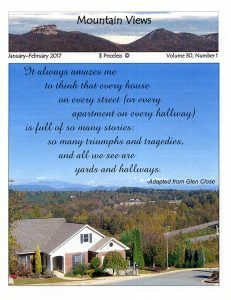 Mountain Views: Chronicling the Lives and Times of Grace Ridge Residents - Grace Ridge Retirement Community - Morganton, N.C. 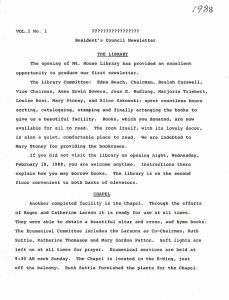 The 1988 inaugural issue of the then-nameless Resident’s Council Newsletter was a sparse, three-page document that highlighted the opening of the Mountain House Library, the “ready for use at all times” chapel, a stamp fundraising project to feed hungry children, location of the new soft drink machines and member list for the Sunshine and Ice Cream Parlor committees. Nearly 30 years later, the diverse interests of residents remains unchanged, but what has evolved is Mountain Views. 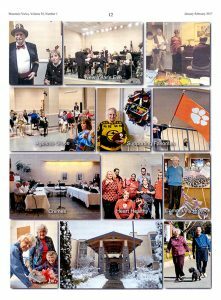 Now a 12-page newsmagazine, it offers a colorful, insightful and meaningful glimpse into the good moods, good times and good life at Grace Ridge. The publication’s mission is simple: “Be a voice of, by and for the residents to provide information about our community and to serve as a permanent record of our lives and times.” Its cost? Priceless. 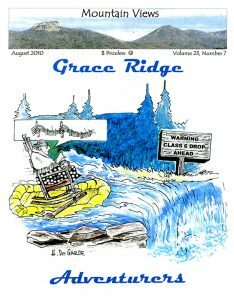 What makes Mountain Views unique is that it’s produced by the Grace Ridge Residents Association and features original content written by residents. 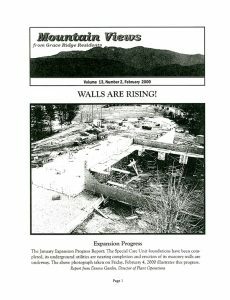 Every other month, 350 copies of Mountain Views are printed and distributed to residents and staff, friends and family of residents and prospective residents. The newsmagazine committee meets regularly to brainstorm theme ideas and assign an editor to take ownership of an issue and solicit submissions from residents. Grace Ridge staff provides production and photography assistance. Each issue features In Memory, New Residents and Keeping Up sections, but readers won’t find resident birthdays, dining menus or calendar listings. “We like to feature a lot of original content and don’t include announcements that are already published elsewhere,” said Sue Bormuth, who’s been involved with Mountain Views for the last decade and currently serves as committee chair. “Our resident writers have come and gone, but several still contribute regularly and we have had a lot of nice surprises. For a while, we even had our own cartoonist,” she said. Originality is what makes Mountain Views so special and why the newsmagazine gets rave reviews, said John Wells, a longtime resident and committee member. The self-proclaimed “community junkie” – through his involvement with LeadingAge NC and the North Carolina Department of Insurance’s Continuing Care Advisory Committee – has visited 35 other retirement communities over the last several years. 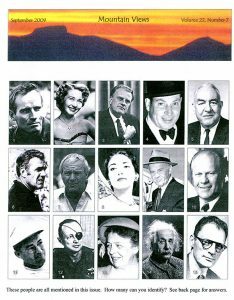 One of Bormuth’s favorite Mountain Views issues is from 2009, when residents shared stories about their encounters with celebrities. Joan Eaton waited out a rainstorm in Arnold Palmer’s bedroom during a Quail Hollow Golf Tournament; Eleanor Robb was a nurse at Albert Einstein’s bedside when he died; Bob Nelson has a silver glove that was left behind by Michael Jackson in a midtown Manhattan restroom; and Eleanor Davis chatted with “Chuck something” while prepping for her cooking segment on a Chicago morning show, only to find out later it was Charlton Heston. The most widely viewed and popular Mountain Views page came about through happenstance, Bormuth said. “A few years ago we had an issue where we didn’t have enough content to fill all the pages and I thought, ‘Oh dear, what are we going to do?’” And so, the back page photo collage idea was born. In the earlier years of the publication, most duties rested primarily on Jeanne Dyer Juraschek, who had a newspaper background. Now, there are many important cogs in the Mountain Views wheel.